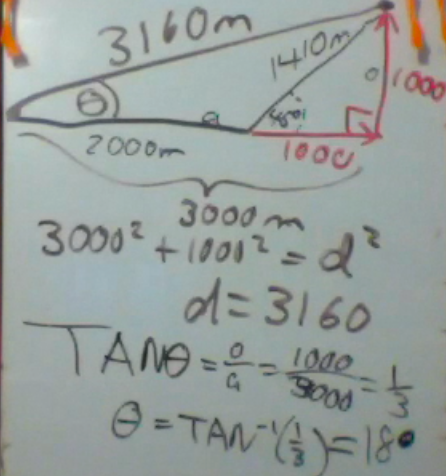 When trying to find the angle in a right triangle, we can use the inverse trigonometric functions, or arc-trig functions. Do not confuse this with the reciprocal functions. 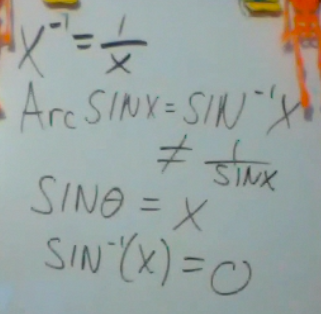 An inverse sine function, (also called arcsine) runs the sine function in reverse. Here is an example where we are given two sides of a triangle. 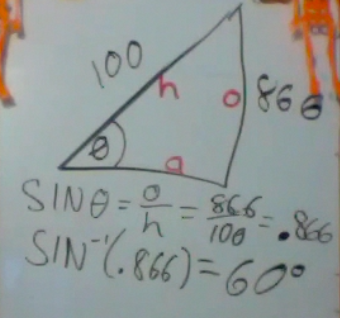 The hypotenuse is 100, and the opposite side is 86.6 We want to find an unknown angle θ. Here is a harder vector problem that you will see in the homework. Let us say you travel for 2000 meters east. Then you walk 1410 meters Northeast at 45°. You want to find the total displacement. First you must break the 1410 into horizontal and vertical components. 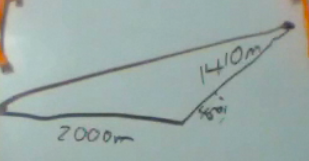 Since it is a 45° triangle, we don’t even need trigonometry. 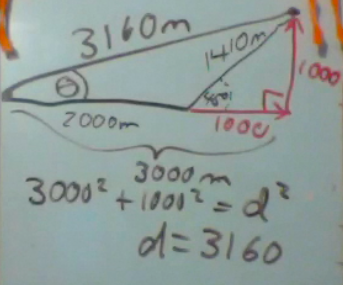 The components are each 1000 m.
Then we use the Pythagorean theorem to find the total displacement. However, displacement has a magnitude and a direction. How do we find the angle θ? We use the ArcTAN function.